I have been making caramel as gifts for at least 15 years. The tattered and faded recipe doesn't have the original source, but I have been tweaking it over the years so at this point I can legitimately claim it to be my own. This most recent tweak is of the salted variety. Silly as it sounds, the addition of a mere teaspoon of kosher salt, not to mention the extra pinch for garnish, offsets yet enhances the candy's sweetness. Speaking of garnish, if you have one of those expensive flaked type of salt lying around, use it for a real fancy-schmancy flourish. 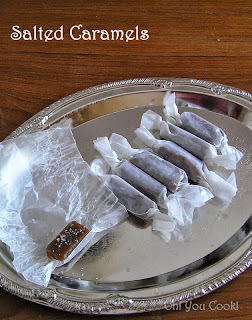 Unlike those store-bought plastic-wrapped cloying squares that cement your teeth together then yanks out your fillings as you pry your jaws open, these caramels lusciously melt in your mouth, leaving a smile along with a longing for more.